Follow Aston Villa v Liverpool live text. Don't forget, you can follow Aston V Liverpool here, where Daniel Sturridge and James Milner have given the reds a 2-0 lead. - Theo Walcott’s 70th minute goal was Arsenal’s first shot on target in this match, while Danny Welbeck scored their sixth and final shot on target in this game. - Danny Welbeck's goal was Arsenal's 100th goal scored in 90+ mins of a Premier League game; more than any other side. Arsenal manager Arsene Wenger talking to BBC Sport: "The effort, energy, intensity was all good. Leicester defended very well but we had bad luck to be 1-0 down at half-time. We were relentless after that - we should have scored more goals. "Mesut Ozil was fouled in the build up to Leicester's goal and the penalty looked very harsh. I'll have to look again but it didn't look like one." "It was a pivotal moment today because the mathematics meant it could be eight points or it could be two points. That is a great change. Guy from Nottingham: So pleased that Arsenal won. Hard work throughout the match paid off. Hodgson talked about English attacking talent, all goals scored by English players. Leicester manager Claudio Ranieri talking to Sky Sports: "It was a fantastic match, very fast. I don't know if in a normal match that our two yellows cards was a sending off. They were normal fouls, but not yellow cards. I think the referee was too severe to us for the sending-off. 11 v 11, I'm sure we win the match. The match was full of fouls so why send off a player? Come on. 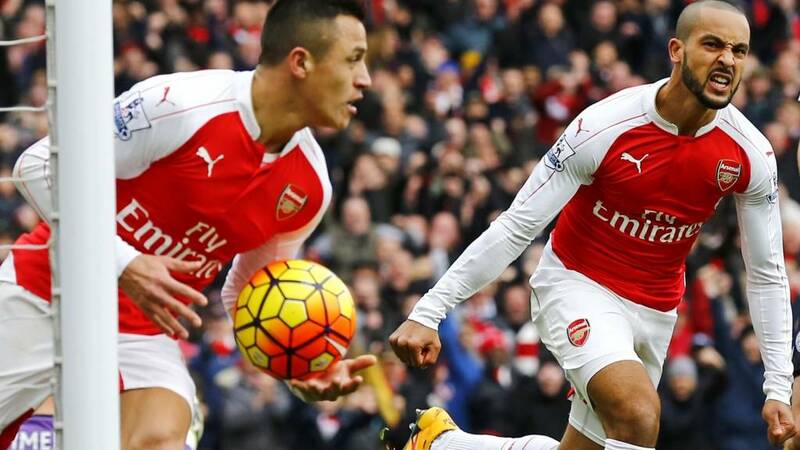 "We know Arsenal are a fantastic team, they move the ball quickly and have skill, but we had to concentrate. We tried to counter attack and we controlled the match very well. "They scored with the last chance - they were smarter than us. "We are still top of the table, got two points more - we must carry on and smile. We lost to our opponents - we must say well done." Arsenal keeper Petr Cech talking to BBC Sport: "We had to concentrate in the final stages because any counter attack was becoming more and more dangerous as we searched for the winner. It was tricky. "What I like about our win is that it is always tricky when opponents are down to 10 men. They have good organisation and are fighting for their lives. We managed to break them down and create chances. We kept missing chances but kept composure and kept coming. On Danny Welbeck: "It has been a great day for him because working hard to come back. we could see last couple of weeks that he was ready and sharp and confident in training. He really deserved." Arsene Wenger tells Sky Sports the Arsenal team chanted Danny Welbeck's name when he came back into the dressing room after scoring the winner. A nice welcome back after nine months out. The Arsenal boss also admits it was a very close decision whether to include Welbeck in the squad or not. Haji Shakeel: Thank you Man U and Van Gaal for giving us Welbeck. Everyone was laughing at Arsenal for signing him. England manager Roy Hodgson spoke about the options he has in attack last night. Looks like Danny Welbeck has just rejoined the mix. Arsenal's match winner Danny Welbeck on Sky Sports: Dying seconds, we kept pushing, had chance after chance. I missed the first opportunity and tried to make amends. It is important and the most important thing is to get the win. It has been a roller-coaster for me, a difficult moment and my family and friends know what I have been through. Arsenal substitute Theo Walcott: "This man hasn't played for nine months and to get into the mix like that, special players come into into big games. That could be massive." Richard, St. Albans: Devastating for Leicester but if you look at their run in I still fancy them if they don't let this knock them. "That could be a huge moment in the title race because you thought Leicester were going to hold on there. The Arsenal players are still out there doing a lap of honour. "Who is going to win it? I have no idea." Howard Horner: HUUUUUUUUGE! That makes Arsenal favourites for the title to me. DANNY BOY!! James Hammond: As soon as Welbeck came on that was coming. In a season full of incredible moments, no way was that not happening. Ali Mason: The. Best. Season. Ever.